Whether you’ve begun your first year of college or your last year of graduate school, chances are good that you’re hauling a laptop along for the ride. Portable computers excel at many things: They’re lightweight, they have great battery life, and they’re much easier to fit into a backpack than an iMac. But in being so mobile, they’re also much more susceptible to dings, falls, smudges, and—worst of all—drink spills. Here’s how to keep your laptop fit and functional. As you frantically dash from one class, event, or party to another, your methods of putting away your laptop and its power cord may be frantic, too. The tough but subtle iGlaze cases will protect your laptop from close encounters with your house keys. Backpack buffer To save your poor computer from being crushed between a full load of “Intro to Psych” books and the sharp edges of your keys, outfit it with one of Moshi’s iGlaze cases (11- and 13-inch MacBook Air; $60). 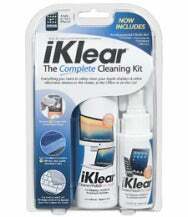 Each case consists of two ultrathin plastic covers for the top and bottom of your computer that snap right on and keep it shielded from incidental scars and scratches. The case comes in translucent, white, and black, too, so you can choose the style that suits you. Customize your laptop, while also protecting it from scratches, with a laptop decal such as this one from GelaSkins. Dapper defense If you want something more fashion-friendly, browse through the laptop decals on GelaSkins (most Apple laptops; $20 to $30). The company features artwork from contemporary artists around the globe as well as classic works by Vincent van Gogh, Georges Seurat, and Gustav Klimt. The decals adhere to the top case of your laptop and offer light protection from scratches while making your laptop look fancy. You can also create a custom skin using your own artwork or photography. Thin scratch protection Looking for an in-between option—something less bulky than a snap-on case, but a little more rugged than a decal? Check out BodyGuardz’ Carbon Fiber Armor (current MacBook models; $50). Available in black, white, and red, this PVC-based textured film adheres to your laptop much like a GelaSkin, but provides a tough surface that keeps the Mac underneath scratch-free. Twelve South’s BookBook cushions your laptop and disguises it as a hardcover book. A case like no other Another fun option for protection is Twelve South’s BookBook (current MacBook models; $80 to $100), a hardback leather case for the MacBook Pro that looks just like a book. It’s padding, it’s camoflauge, and it’s a literary statement, all in one. SFBags’ handsome CitySlicker protects your MacBook Air with layers of compact cushioning. 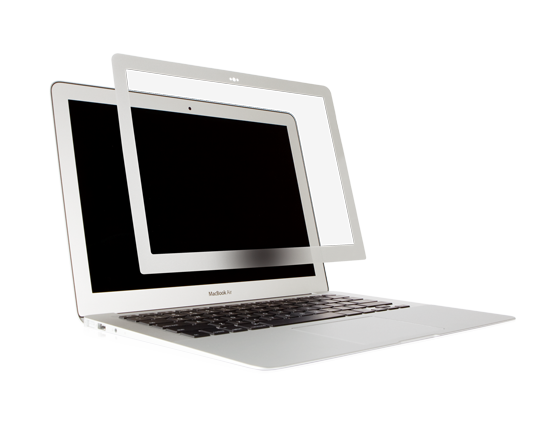 Also worth considering is SFBags’ CitySlicker (11-, 13-, and 15-inch MacBook models; $129 to $149). This very thin, compact case fits easily in a backpack and sandwiches your MacBook Air or MacBook Pro with Retina Display in layers of impact-resistant plastic, neoprene, and padding. The outer flap is a low-key, attractive leather panel. If you’re the typical laptop lugger, you type everywhere: at the library, on the lawn, at the dining hall, and quite possibly at 3 a.m. in the morning while munching popcorn. As such, it’s not unlikely that your keyboard will get gummy, your screen smudged, and your ports dirty. Moshi’s iVisor antiglare screen protector sticks over your screen, guarding it from dirt, fingerprints, and scratches. Take the iVisor off to wash it and then put it back on again. Cover ups If you hate cleaning—and what student doesn’t?—you can largely avoid the mess with a good screen, keyboard, and case protector. Moshi’s line of film protectors is especially great for this purpose: The company makes antiglare screen protectors for both the MacBook Air and MacBook Pro ($37), clear keyboard protectors ($25), and a palm and trackpad protector ($20). Buy all three together for a discount. KB Covers’ Final Cut Pro keyboard cover shields your keyboard from dirt and crumbs while serving as a quick reference to program shortcuts. Prevention with pizzazz If you prefer to protect your laptop while personalizing it, check out the new slim Designer Series from KB Covers (13-inch MacBook Air, MacBook Pro models; $30). The company offers keyboard covers adorned with doves, dalmatians, roses, the American flag, and more. 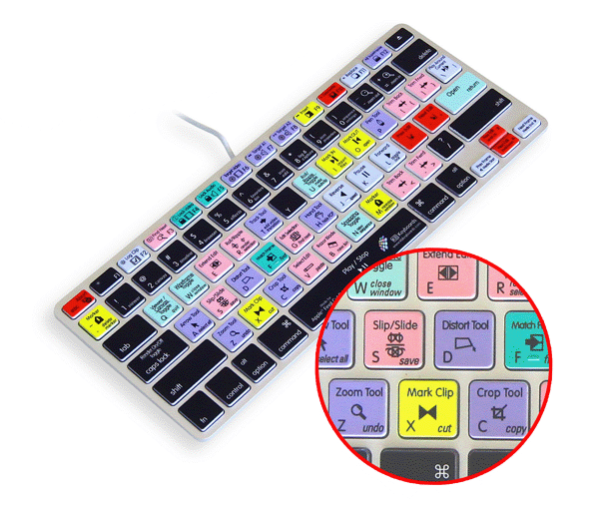 For those majoring in film, photography, or sound design, KB Covers also makes a series of protection overlays that list shortcuts for popular applications such as Final Cut, Photoshop, and Pro Tools. Although protecting the outside of your computer is all well and good, safeguarding the data within it is just as important. After all, most of your work will reside on its hard drive or solid-state drive—and it takes just one bad liquid spill to destroy three months’ worth of term papers. Copies in the cloud The number one way to head off this problem is to back up your work. Dropbox gives you 2GB of space for free—that’s enough room for a decent amount of Word documents and Keynote presentations—and you can upgrade your space to 100GB for $99 per year, 200GB for $199 per year, or 500GB for $499 per year. Add the Packrat feature for $39 per year, and Dropbox will retain old versions of files in case you accidentally delete them or want to retrieve something later. One great thing about keeping your files on Dropbox is that you can get to them on all of your devices (phone, iPad, and Mac) as well as anywhere you have access to a browser and the Internet—say, in a computer lab or at your study buddy’s PC. Another service Macworld staffers love is CrashPlan, which provides both online and onsite storage for a monthly fee. Extra hard drives If you’d rather store your data locally, you can pick up an external hard drive from Amazon, a local retail store, or Apple for $100 to $500, depending on how much space you need; you can then use Apple’s Time Machine software or a third-party app such as Shirt Pocket’s $28 SuperDuper or Bombich Software’s $40 Carbon Copy Cloner to back up your work. Up-to-date software Spills aren’t the only thing that can damage your hard drive, of course: Software corruption poses another threat. Even though relatively few viruses and Trojan horses are written for the Mac, you should still keep up-to-date with any software and OS X updates that come down the pipeline from Apple. 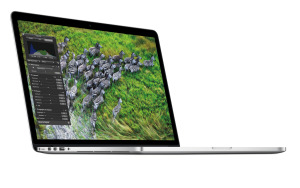 To check for system patches, go to the Apple menu in the upper-left corner of your screen and click Software Update.